Interested in a career in Law Enforcement or Investigation? 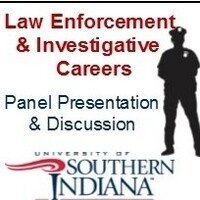 Join us for our annual law enforcement and investigative careers panel presentation. Local professionals will speak about their education, experience, internships, the agencies they work for and how you can prepare for similar careers. Discussion will be followed with refreshments and time to meet one-on-one with presenters.